Designers have figured out a way to fully clothed their customers during the hot temperatures and still keep them ventilated. Adding a few holes can definitely do the trick. Only four days in of New York Fashion Week and I already noticed looks assembled with a perforated top. At Alexander Wang, it's long sleeve jacket and the pockets of the capri were perforated. 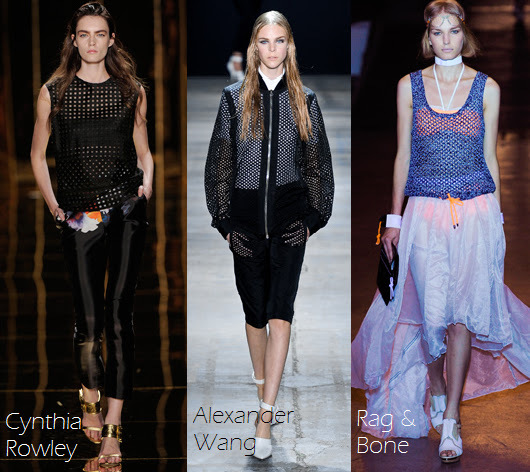 Visually, perforation on accessories and on clothes is a cool design technique but for Spring 2012 Cynthia Rowley, Alexander Wang and Rag & Bone have done so by making it sexually appealing.